Sweet and savory, this healthy Brown Sugar Roasted Acorn Squash is an easy side dish for any night of the week! Preheat oven to 350 degrees F. Line a baking sheet with foil or parchment and spray with nonstick spray. Set aside. Slice squash in half. Scoop out the the seeds. Place squash flat side down on a cutting board and slice into 1 - 1.5-inch slices. Arrange slices in a single layer on the prepared baking sheet. Brush the top of each slice with half of the melted butter. Sprinkle with half of the brown sugar and season with salt, to taste. Bake for approximately 45 minutes, or until squash is caramelized and tender. Halfway through the baking time, flip the squash over; brush with remaining melted butter, sprinkle with remaining brown sugar, and season with additional salt. Garnish roasted acorn squash with chopped, toasted pecans and fresh herbs, if desired. Remember, the skin is edible! Cooking Just for Two? 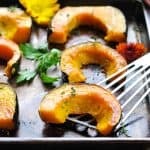 Cut the ingredients in half and just roast 1 acorn squash. The rest of the cooking instructions remain the same. Wash acorn squash seeds in water, and pat dry. Place the dry seeds in a small bowl. Toss with olive oil (as much as you need to coat the seeds; the amount will vary depending on how many seeds you have); season with salt. Spread seeds in a single layer on a foil-lined baking sheet that has been sprayed with cooking spray. Roast for 15 minutes, or until the seeds begin to pop. Allow the seeds to cool on the tray before serving.